Ally is head teacher at Tante Marie Culinary Academy. After graduating from Tante Marie herself, in 2005 Ally’s first role was as private chef to the Royal family at Kensington Palace. In this position she gained valuable experience in catering for both private fine dining and everyday menus. 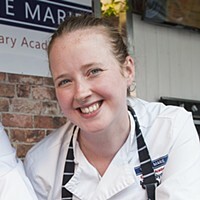 Her effervescent personality and hardworking enthusiasm, combined with her passion for sourcing excellent ingredients to create fabulous food, define Ally’s attitude to her working practice. She is also an experienced demonstrator and is brilliant at imparting specialist ‘how-to’ techniques and tips.